Announcement Welcome to Meem's Seams! Handmade baby shoes and clothing for your little explorers! Turnaround is 14 business days, thank you so much for stopping by and supporting handmade! I love using unique, vintage, up-cyled and organic fabrics to create one of a kind shoes and clothing for children. My shoes have been tried and tested by my 5 children, my many nieces, nephews and all my friends' babies....they stay on! 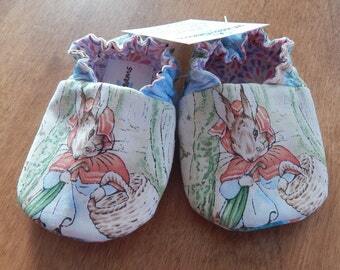 Check out my variety of One of a Kind shoes featuring Beatrix Potter's Peter Rabbit and friends! Visit again soon for new listings and if you don't see something just right, I love custom orders for a size and style just right for your little explorer! Welcome to Meem's Seams! Handmade baby shoes and clothing for your little explorers! These baby shoes are BEYOND WONDERFUL!!! They are PERFECT in every way!! Great workmanship!!!! The baby isn't born yet...but I'll send a picture in a few months!!! Absolutely adorable little booties. I cannot wait for my granddaughter to arrive so I can put these darling little shoes on her. Her arrival is expected around Easter! Thank you so much! I will allow refunds if the buyer feels the item received was ill-represented by the listing, and pay for return shipping. Variations of color are not included in this policy. I do my best to accurately photograph and describe each item. If you have ANY questions contact me so we can make sure you will love your purchase! I accept Pay Pal. I ask that you please pay for your custom listings within 5 days of posting. All orders will ship in 10-14 business days. All US orders will come with tracking and international orders with the customs #. All orders ship first class, if you wish to upgrade your shipping, contact me and I will send you a quote reflecting the cost with new shipping price. Allow 10-14 business days for custom orders to be completed and then shipped, thanks! Please be accurate in measuring your child's foot. Have child stand on a piece of paper, mark at heel and longest toe. Remove paper and measure your markings. Then add 1/4"-1/2" to ensure a nice fit for your little one. CUSTOM ORDERS: I will accept exchanges in most circumstances if the fit is not as you were hoping for your custom order, but if it is due to measurements, you will be responsible for all shipping costs back to me and for me to send you a new pair. If shoes are returned in less than new condition (i.e. they've been used outside or have stains) I cannot accept them. Also, because much of my fabric is limited and unique, all reserved listings must be paid for within 5 days of being posted. After 5 days your reserved listing will be taken down to allow others the chance to purchase the items. Thank you for understanding.